Hey all! I hope you are doing well and enjoying the Summer season (if it is Summer) wherever you are! We are a little out from the D23 Expo and we had an absolute blast. There was so much to do and see and we even got to meet many of you while we were there. Most importantly there were a lot of great panels and announcements made, especially at the famed Parks panel. 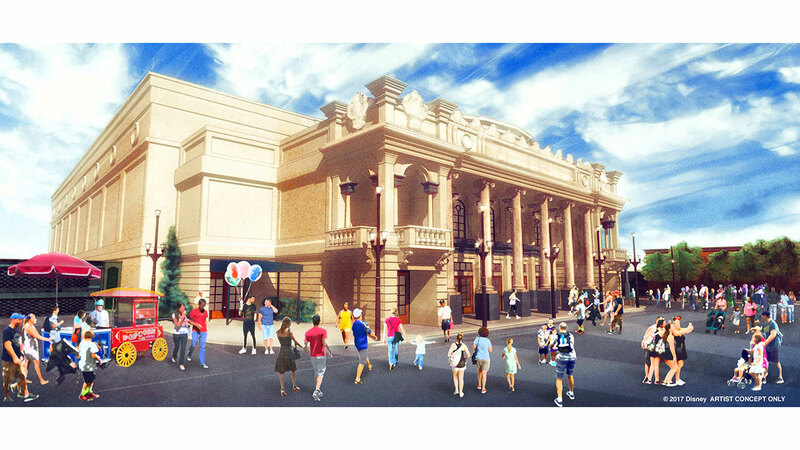 One of the most intriguing was of the new theater going in at The Magic Kingdom at Walt Disney World and that it was to be based off of a theater from Kansas City. That theater is the Willis Wood Theater. Both Laura and I were surprised by this news and even more surprised to learn of this theater. Having both been born and raised in Kansas City we thought we had a pretty good handle on major points in history. Neither of us had ever heard of this theater and those savvy with Disney history were confused about the choice and its connection to Walt Disney. Once we got back from our trip I knew we wanted to head to the library and find out more for ourselves. We headed straight to the Kansas City Public Library-Central branch and into the special collections as we found that is where much of the information on the Willis Wood Theater was. We were able to get a couple books and review microfilm of all the newspaper articles written on the theater. As I was trying to load the film onto the machine, I was having trouble and got the librarian. She came over to help and informed us that the last person to use this was actually from the Disney company! Pretty cool to be following in the footsteps of the actual Disney researcher. Sorry, got on a tangent there….let’s get to know more about this theater and find out if there is a connection to Walt. The Willis Wood Theater named for its builder Col. Willis Wood, is said to be the most beautiful theater in Kansas City’s history and according to its designer, Louis Curtiss, “the handsomest theater in America”. Before we talk about the actual theater let’s get to know a little more about the players in this story. Col. Willis Wood was a successful dry-goods seller in St. Joseph who moved to Kansas City in 1900. Right around this time the premier theater in the city was the Coates Opera House. However, in 1901 it was completely destroyed in a fire leaving Kansas City without a great theater. Enters Wood who wanted to fill this cultural void and hired Curtiss to help him bring it to life. Curtiss was a Canadian born architect that had a prosperous career of his own, designing many buildings not only in Kansas City, but all over the country. He became friends with the President of the Santa Fe railroad and designed many depots for them. Two other buildings of interest are the Missouri Pavilion at the 1903 St. Louis World’s Fair and the Boley building in Kansas City. The Pavilion is just interesting because I love World’s Fairs, but the Boley building is important as it was the first steel and glass curtain building in the WORLD! That is a building that is basically glass on all sides. Curtiss was quite the interesting character who, according to Kansas City theater expert D. Austin Latchaw, dressed only in white, cut his own hair, and loved speeding around Kansas City in his motor carriage and honking his horn. Only such an interesting mind could make what he did. Wood wanted this to be a theater like no other and truly spared no expense when creating his eponymous masterpiece. Look at that theater! This is more representative of what the colors of the theater looked like. So ornate and the height of opulence; an architectural achievement never again repeated in Kansas City. The yellow stone and white enameled terra-cotta was accented by the circular balconies on each corner with red, blue, and green tiles inset. It was described to look much like a wedding cake with the rounded dome that topped the columned main entrance. Another interesting detail was a sign near the carriage entrance that would flash the number of the carriage for the patron that was wishing to leave. The foot-high numbers could be seen from even a block away. The opulence continued inside with mahogany doors opening to a large marble-floored lobby with an elliptical domed ceiling of yellow and gold leaf. Wood even had electric lights incorporated into the design, something not seen in a theater before in Kansas City. From there you went through swinging doors, again of mahogany, into a foyer that would then lead into the auditorium. A central dome on the ceiling was very colorful and had a great deal of gold leaf in order to pick up the light and look like stars above theater goers. The turret at the top of the dome allowed fresh air to be pulled into the theater and would even pass over coals in the winter and coils of cooling fluid in the summer to provide air conditioning of sorts. The dome or turret at the top of the building can be seen with its large windows for air flow. The most striking feature, however, were the caryatids of beautiful females that lined the walls. Their female forms looking draped in fine fabrics and their outstretched hands held back the pink-silk-lined green velvet curtains. These statues were considered, “the finest real works of art [Kansas City] has ever turned out”. One of the most interesting features was not in the theater, but below it. A tunnel stretched from the theater underground and across to the Baltimore hotel bar. The tunnel was lined with enamel tiles and marble wainscoting and provided a path for people to get a drink at intermission or during an unpopular production. This tunnel was very popular and was often congested leading to late arrivals and disturbances during performances. This became popularly known as “Highball Alley” and would later be used to store alcohol during prohibition. The theater opened August 25, 1902 and quickly became renowned, not only for its beauty, but its ability to draw in the top talent and acting companies in the country. However, as brightly as it shown initially, it fizzled relatively quickly. The Schubert Theater opened in 1906 and proved to be competition that the Willis Wood couldn’t handle. It changed formats from the most popular traveling shows to stock performances in the area then to film with a small detour to Burlesque in 1913 and 1914 and finally in 1917 the theater was going to switch back to film however a horrific fire broke out on January 8th all but destroying the theater doing nearly $60,000 ($1.1 million today) in damage. The theater was just a shell for another year and was finally torn down to build the Kansas City Athletic Club building known as Mark Twain Tower, which still stands today. Now that we know more about the actual Willis Wood Theater I wanted to dig a bit into whether Walt has a connection. I personally have never heard this theater mentioned in regards to Disney’s time in Kansas City. I know that he did visit theaters when he was younger to see movies, one such being a silent version of Snow White and the Seven Dwarfs. Breaking the facts down, the theater was open for about 7 years when the Disney family would have lived in Kansas City. During this time it changed formats several times as I mentioned before and it did show films off and on during this time. This means it could have been a place that Walt visited. However, Walt would have been in his early teens at the time and we know he would have been going to school and running the family paper route with his brother Roy. This gave them little time for other activities like films and such. Additionally, the Willis Wood Theater was a good distance away from the Disney home. You can see the Disney home at the far right of the map and the Willis Wood theater was around both the Newman Theater and the Kansas City Slide Co. At the time it was likely that Walt would have used the street cars to get around, but it would have still likely taken a while for him to get to that area of town from his home. On top of this he wouldn’t have had a lot of extra money to be attending too many shows. In the end I don’t believe there is enough information to without a doubt say Walt Disney never went to the Willis Wood Theater, but I feel it is unlikely that he did. While Walt may not necessarily have a direct connection with this particular theater it is clearly the grandest theater to be built in Kansas City. I imagine this is what the Disney Co was looking for when they began this project. Additionally, having the connection to Kansas City is important as well. That is all I have for now. I appreciate you taking the time on this rather lengthy journey with me. As always I hope you found something you enjoyed. Have you any evidence that Walt Disney visited the Kansas City Zoo? I don’t know of anything specifically tying him to the Kansas City Zoo but he used to hang out in Swope Park quite a bit. There are many pictures of he and his friends there so it is very possible they visited the zoo as well. I’ll try to do a post soon about it so you can see these photos. Of course if I find anything about him and the KC Zoo I’ll post about it. Let me know if you have questions about anything else.